I edited Kyra’s photo to give a sense of what the original dog looked like before it faded. I’m looking for a backup to my beloved Angel dog. I believe Eden was the manufacturer, somewhere around 1981-82. She’s about 7 inches tall with brown plastic eyes, yellow ears and pink head and body. On her right side she has a turn key that winds up a music box inside of her, playing “Doggie In the Window”, and also flopping her head back and forth with the music. I highly suspect that she is an Eden product, because of the style of the turn key. I’ve managed to find a cream and blue version on Ebay, but nowhere online the pink and yellow one I have. 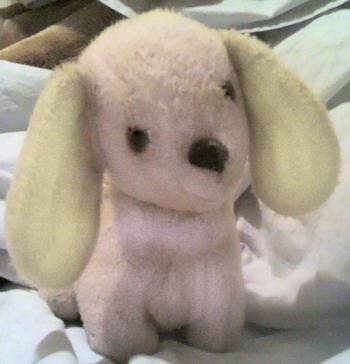 She was my first real toy, given to me by my Nana. I named her after my Godmother’s dog, who was the first real dog I ever loved. I carried her everywhere when I was a little kid, to the point where she’s now light tan from fading and her neck is limp from the way I used to lug her around in a sort of head lock. I’ll always keep the beat up “original” Angel, but, honestly, I’ve had her so long I really don’t remember what she looked like in full fuzz and full color, with a neck that’s not limp from love. Please help me find another, if possible. This may be the wrong color one you have found but it is so similar I have to wonder if it could be batam for the brand.